29 in. (73.5 cm.) high; 23 in. (58.5 cm.) diam. The hexagonal tea-table, conceived in the George III Roman fashion, has a segmental-parquetried top inlaid with a golden sunflower, while its pillar has a serpentined tripod 'claw', with volute-footed trusses enriched with trompe l'oeil Gothic-cusped flutes. 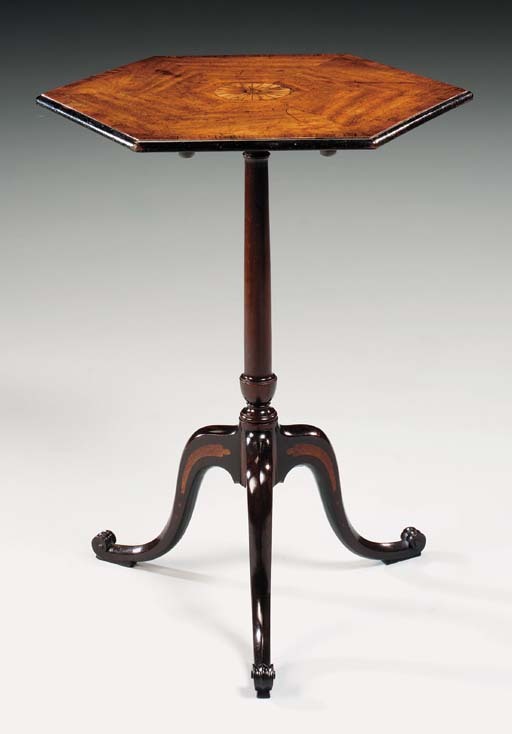 In 1764 Thomas Chippendale (d. 1779) supplied two related tables, veneered in amber-coloured 'Guadelupe' mahogany to Sir Lawrence Dundas for his London mansion in Arlington Street (see C. Gilbert, The Life and Work of Thomas Chippendale, London, 1978, vol. I, pp. 156 and 159 and vol. II, fig. 470). Their vases were acanthus-wrapped, and their pillars, rather than 'claws', were fluted. However Chippendale adopted related Gothic-cusped flutes for a firescreen 'claw' supplied in the mid-1770s for Newby Hall, Yorkshire (ibid., pp. 265-6 and fig. 334). A 'Harewood' drawing, which is attributed to Chippendale and dates from the early 1770s, also depicts a related tea-table 'claw' with plinth-supported trusses (ibid., p. 203 and fig. 464). The latter also featured on a pattern for basin stands and a tea-kettle stand in Thomas Chippendale's The Gentleman and Cabinet-Maker's Director, l762, 3rd ed., pl. LV. A closely related satinwood tripod table, with similar Gothic panelled legs, was sold anonymously, in these Rooms, 7 July 1994, lot 68. Another related table was sold by the late N.M.L. Watson, Esq., in these Rooms, 21 November 1985, lot 52 and a further rosewood table was sold anonymously, Sotheby's London, 18 November 1994, lot 107. A further closely related tripod table, but with fluted column, was sold anonymously, in these Rooms, 11 November 1999, lot 30 (£84,000 inc. premium).